The Baja Brewing Company is the only microbrewery in Baja California Sur. They have pubs in both Cabo San Lucas and in San Jose del Cabo. The one in Cabo is on top of the Cabovillas resort and the one in San Jose del Cabo is located downtown with live music Thursday, Friday and Saturday nights. Try the pizza! Yum! 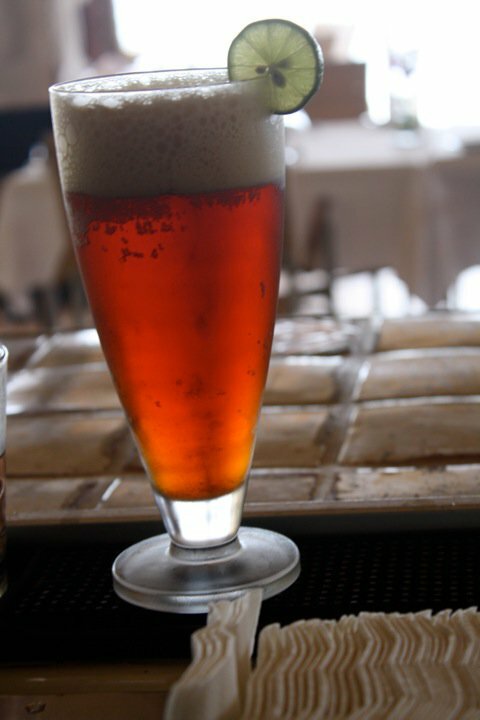 You can find the Baja Brewing Company’s beers at hotels and restaurants through out Cabo. This is a photo of their Baja Red taken at the Cabo Surf Hotel, where they serve a few of the Baja Brewing Company’s beers. I loved how the light illuminated the red color. The Baja Red is an amber ale with medium to high bitterness. It is 6% alcohol. Have you ever tried one of the Baja Brewing Company’s beers? Which one is your favorite? Where did you try it?